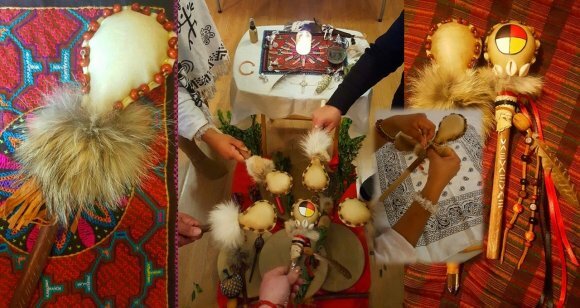 Come and join us in Sacred Ceremony and create your very own unique and power-full Shamanic Medicine Rattle. As we join in the creation of rattle making we put our love, intent, and energy into this powerful medicine tool. It will make a truly special ally who will assist in the process of healing, song, journey, and helping others. We will open the circle, call in our Ancestors, guides and power animals, set our intentions and prepare our rattles for creation. In this full day workshop, you will be shown the full art of rattle making in the traditional way, in a day of ceremony we will honor the spirits of the animal and the tree while the sacred process. 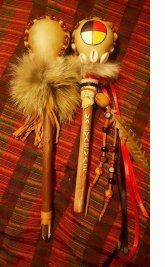 I will lead you on a journey to connect with the spirit and medicine of your rattle. Your investment is for a natural hide and includes decorative items. Full payment secures your place, payment due before July 1st. All rattles made with natural materials and deer skin. All materials, instruction, guidance, and support provided. * Demo on rattles from around the world and their uses. With your rattle you will venture on a journey and relationship of healing, and song. * Mia needs to order materials class must be paid in full before July 1, 2019. 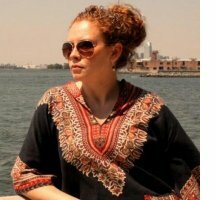 Mia is a certified Reiki practitioner, Energy Worker, and Visual Artist that took creativity to another level. She uses the arts, culture, and traditional/indigenous medicine modalities to help heal and inspire.